Definition: The Market Structure refers to the characteristics of the market either organizational or competitive, that describes the nature of competition and the pricing policy followed in the market. 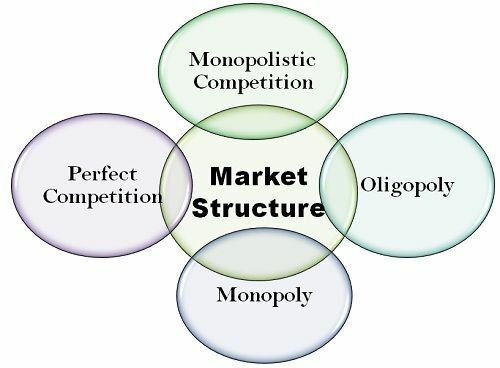 Thus, the market structure can be defined as, the number of firms producing the identical goods and services in the market and whose structure is determined on the basis of the competition prevailing in that market. The term “ market” refers to a place where sellers and buyers meet and facilitate the selling and buying of goods and services. But in economics, it is much wider than just a place, It is a gamut of all the buyers and sellers, who are spread out to perform the marketing activities. The number of sellers operating in the market. The number of buyers in the market. The nature of goods and services offered by the firms. The concentration ratio of the company, which shows the largest market shares held by the companies. The entry and exit barriers in a particular market. The economies of scale, i.e. how cost efficient a firm is in producing the goods and services at a low cost. Also the sunk cost, the cost that has already been spent on the business operations. The degree of vertical integration, i.e. the combining of different stages of production and distribution, managed by a single firm. The level of product and service differentiation, i.e. how the company’s offerings differ from the other company’s offerings. The customer turnover, i.e. the number of customers willing to change their choice with respect to the goods and services at the time of adverse market conditions. Thus, the structure of the market affects how firm price and supply their goods and services, how they handle the exit and entry barriers, and how efficiently a firm carry out its business operations.